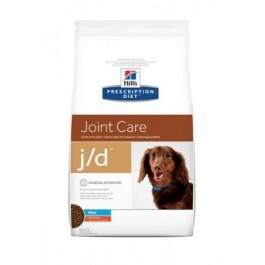 Hill's Prescription Diet j/d Canine Mini is a complete and balanced food for small breed adult dogs, recommended for the support of the metabolism of joints in the case of osteoarthritis. This is clinically proven nutrition formulated to help maintain healthy cartilage and ease aching joints, it helps to reduce the dosage of non-steroidal anti-inflammatory drugs by up to 25%, to interrupt the cycle of osteoarthritis and is an alternative to Glucosamine & Chondroitin supplements. High levels of omega-3 fatty acids - soothes tissues and eases aching joints. High levels of eicosapentaenoic acid (EPA) - helps to maintain healthy cartilage. Enriched with glucosamine & chondroitin sulfate. High levels of L-carnitine - facilitates the conversion of fat to energy, which helps maintain a healthy weight and avoid extra stress on joints. Added superior antioxidant formula - neutralises free radicals in the joints. Added L-lysine - helps preserve muscular support for joints. Controlled protein, calcium, phosphorus and sodium - avoids excessive intake making this food appropiate to be continued when dogs become older. Maize, rice, flaxseed, soybean meal, poultry meat meal, pea bran meal, digest, animal fat, fish oil, dried whole egg, minerals, L-carnitine, crustacean hydrolysate, pork cartilage hydrolysate, vitamins and trace elements. Naturally preserved with mixed tocopherol and citric acid. Hill's Prescription Diet j/d Canine Mini should be recommended by your veterinary surgeon. For detailed information on feeding amounts and how this food can help your pet, please consult your veterinary surgeon. Exclusively feed the recommended Prescription Diet food and keep fresh water available at all times. Please note that this is a guide only and that individual animals may have different requirements. Adjust the feeding amount to maintain the optimal body weight.